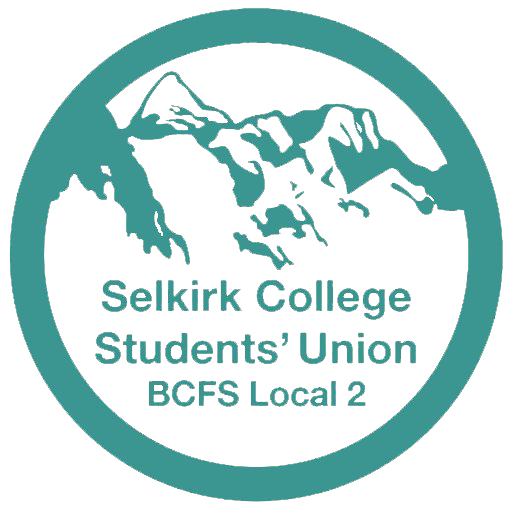 Students at Selkirk College are members of the Canadian Federation of Students, British Columbia Federation of Students, and the Selkirk College Students’ Union. As a result we have representatives working on our behalf with all levels of government. Our representation was intentionally designed to match the democratic systems in Canada in an effort to maximize the ability of students to advocate on our own behalf. The Local prides itself on its past successes. In 2017, after campaigning with other member locals of the British Columbia Federation of Students we were able to secure a return of adult basic education(ABE) funding with our Don’t Close the Doors campaign. This decision has returned ABE to it’s tuition fee free status for all students. Through work with out coalition partners we are also able to lobby for changes that benefits our members. Students have supported the Fostering Change campaign of the Vancouver Foundation, calling for a system to fully fund students who have been in government care. In September of 2017 the British Columbia provincial government announced a fully-funded tuition fee waiver for those who have been in the government care system. Our ability to create effective change is due to our collective campaigning with other member locals of the British Columbia Federation of Students. These successes include the implementation of residences in Nelson, a 2 percent cap on tuition fee increases in British Columbia, an $800 million increase in federal funding for post secondary education in 2007, and Canada’s first national system of student grants, announced in February 2008. Locally, the students’ union is the official voice for students at Selkirk College, and provides representation and advocacy. There are student representatives on many committees of the College, as well as four seats on the Education Council and two on the Board of Governors. Students are always needed to act as representatives on committees. If interested in putting your name forward, email your elected representatives at questions@selkirkstudents.ca. Advocacy campaigns are designed to educate the public about student issues, to mobilize students, to influence decision-makers, and to affect change in government policies. 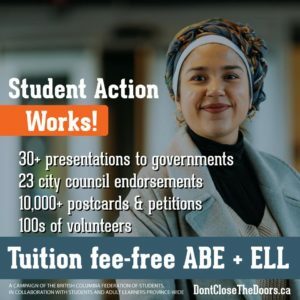 The Local works with other students’ unions in the British Columbia Federation of Students to implement campaigns to fight for a universally accessible, high quality system of public post-secondary education. In January 2019, the Selkirk College Board of Governors will consider a motion to increase tuition fees for the coming year. If the increase passes, students will yet again pay thousands of dollars more into the College’s budget next year. Tuition at the College has increased every year since 2001, and every year it excludes more working people from accessing post-secondary education. Meanwhile, because of the high cost of tuition fees and other expenses, students are forced to make impossible choices between food, rent, and education. With every increase, students who could previously just afford to attend are forced to withdraw mid-program, putting to waste the years and tens of thousands in savings or debt they sunk into their education before another tuition increase put program completion beyond their means. Students cannot afford to pay another dollar. 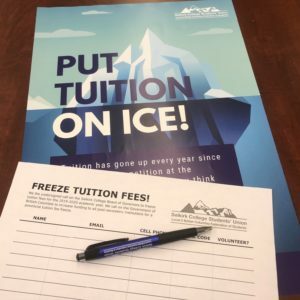 Please take 3 minutes to write an email to ask the Board of Governors to freeze tuition fees: we have a template letter prepared for you here, with all the information you need to send your letter. 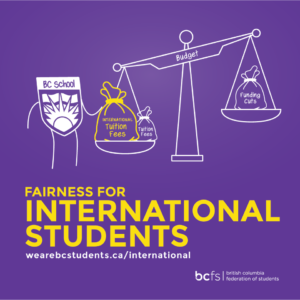 For BC international students tuition fees are unregulated and can increase at any time, and can do so without any notice to students. Domestic students have won a measure of predictability to their tuition fee increases under the BC government’s Tuition Fee Limit Policy which caps domestic students’ tuition growth at a 2% annual increase. Meanwhile, tuition fees for international students in BC have increased by 64% since 2006. We are asking the BC government to amend the Tuition Fee Limit Policy to include the regulation of fees for international students as well. To learn more about how you can help, contact your local students’ union. The high cost of textbooks is one more barrier that students face once they are enrolled in post-secondary education. In fact, since 2002, the cost of textbooks has nearly doubled. 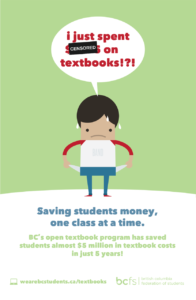 Currently 26% of BC students choose to not register for a course due to textbook costs. An option to curb these costs is the implementation of Open Education Resources (OER). OERs come in many forms: full courses, lesson plans, videos, exams, and textbooks. These are available in digital formats for free or in print at a very low cost. In the past 5 years, open textbooks have saved students more than $6 million; with more funding even more OERs can be produced! Talk to an instructor you think would be interested in adopting open education resources. You can also contact your students’ union if you’re interested in talking to your instructors, but would like more support getting started. Despite the increasing proportion of Indigenous people with university degrees, the attainment gap with non-Indigenous people has been widening. 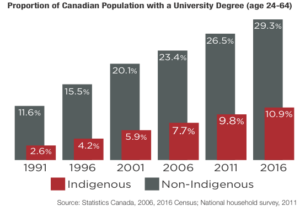 The proportion of Indigenous people who have a university degree has more than quadrupled compared to 25 years ago, yet the gap between Indigenous and non-Indigenous people has more than doubled over the same period. These disparities show that there is still an issue with attainment and access to post-secondary education for Indigenous peoples in Canada. 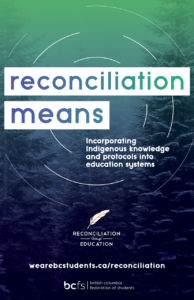 The Truth and Reconciliation Commission’s recommendations for post-secondary education focus on providing necessary funding to educate teachers on how to integrate Indigenous content and knowledge in the classroom. Investing in Indigenous education is a necessary step towards reconciliation and provides a pathway to stronger economic stability and reducing income inequality. Funding our studies has never been harder or more expensive. Since 2014, the Selkirk College Students’ Union has been working with the BC Federation of Labour, and workers across North America to fight for fair wages. British Columbia have the highest cost of living in Canada but if you are working full-time our minimum wage would still keep you below the poverty line. Students need to be able to survive on minimum wages in order to fund their studies for future careers. If the government really wants to strengthen the middle class, a livable minimum wage is an essential part of doing so. Through organizations such as the Canadian Federation of Students and the Sierra Youth Coalition, students are mobilizing across Canada to put climate change and other environmental issues on the political radar. Effecting change through this campaign has two equally important elements: individual action and policy change. We can all make important choices to reduce our own wasteful or unhealthy consumption, but at the same time, we cannot let local, provincial, or federal politicians off the hook. Maximizing sustainable practices has to take the form of regulatory and policy changes at the government level. For example, organizing a boycott of harmful products is important, but so is a coordinated lobbying campaign to make the product illegal or more effectively regulated. In addition to advocacy on education and environmental issues, the students’ union also works on a range of social justice issues, including homelessness, violence against women, justice for Aboriginal peoples, and improving rights for persons with disabilities. Here are some highlights of ongoing or recent work.